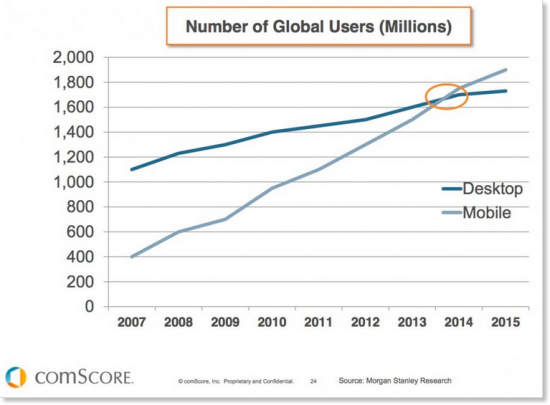 Back in 2008 Internet Analyst Mary Meeker predicted that mobile search would surpass desktop search in 2014. She wasn’t far off. Google confirmed that they were getting more mobile searches performed on a mobile device in May of 2015. It should come as no surprise, really. Look around. Everyone has a mobile device in their hand or their pocket. What do mobile searchers look for? Things to entertain them while they are on-the-go or something they need or want right now. Restaurants top the list, but they also search for local services. 65 percent of smartphone users said their searches were “driven by a need for information on the go.” They value specific, concise information optimized for their device. How can you use this research data? Design and program your website so that is is responsive – it will optimize the content and display it correctly for the device being used. Make sure your website meets the Google mobile-friendly requirements. Despite two Google mobile search updates in the past year, almost a quarter of the Inc 500 companies’ websites are not yet mobile-friendly. Discover what your customers and potential customers are looking for – and provide that content in a short, snackable format so it is easy to find and easy to consume on the go.